Rosemary mint has long been one of my favorite scent blends. The combination of rosemary and peppermint essential oils boast both a pleasant and invigorating scent blend while also lending their anti-fungal, anti-bacterial and anti-inflammatory properties. For this natural rosemary mint cold process soap recipe I combined these two natural essential oils with cocoa butter, illipe butter and sweet almond oils for their moisturizing properties while coconut oil and palm kernel flakes help to boost the lather. You’ll follow your basic cold process soapmaking instructions to make this rosemary mint cold process soap recipe. This batch will yield 10-12 bars depending on how they are cut and will fit inside one of my DIY wooden loaf soap molds. Begin by mixing your lye/water. Measure out the water into a pitcher or large glass Pyrex measuring cup, then weigh out the lye using a digital kitchen scale and slowly pour into the water mixing into the lye dissolves. Set aside to cool. Weigh out the soapmaking oils into a large stainless steel pot. Heat over medium heat on the stove until all oils are melted then remove from heat. Once the oils and lye/water have cooled to about 100°F, pour the lye/water into the oils and mix with a stick blender until you reach trace. Stir in the essential oils and mix well, then pour the soap into your prepared mold. Cover and insulate for 24 hours. 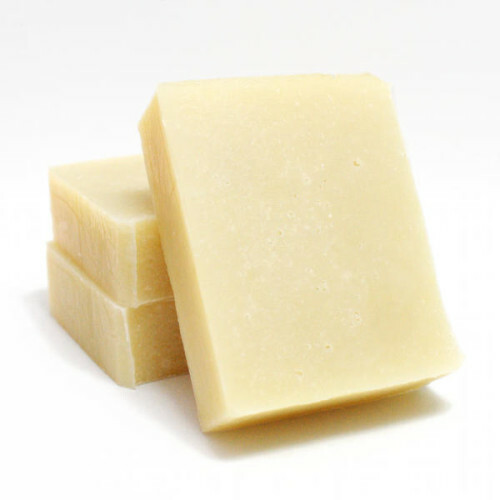 After the 24 hour insulation period you’re ready to unmold and cut your soap loaf into bars. Allow to cure 3-6 weeks before use. If you’re interested in more recipes that use illipe butter be sure to also check out my homemade beer soap recipe, lavender & fir soap recipe, and my homemade gardener’s soap recipe. And for more natural handmade soap recipes as well as DIY bath and beauty recipes, be sure to follow my DIY Bath & Body board on Pinterest. You can also follow my blog on Blog Lovin’ as well as find me on Facebook, Twitter, Tumblr and Instagram! It comes out a very light cream color but over time it will darken a little. Rebecca, do you have any tips on working with the beeswax? I’ve been trying to read up on it, and I’m finding a lot of conflicting opinions of when and how to put everything together — lye-water included. How do you keep the beeswax from cooling into little sandy bits, since the melting point is 145 (ish) degrees? Should I really combine everything at 100 degrees, or should it be higher? How high is too high? I have a whole list of soap recipes from your blog that I can’t wait to try — at the top is this one and the pumpkin soap! Wonderful job! I have used beeswax several times and I don’t include it in my calculations with the oils. I add a small percentage to the oils when I’m melting them all in the pot. 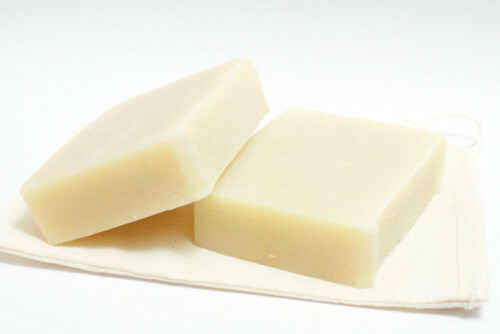 I typically mix my other soaps at 95-100° but I do mix the ones with beeswax slightly hotter around 105°. I haven’t had any issues with it separating into “little sandy bits” although this has happened to me in creams – or rather salves with a high percentage of oils – and such that I’ve made and summer hits and what once was smooth and creamy isn’t any longer. Hope this helps. I kind of went blind into using beeswax but it’s worked for me so far.